12/5/05: Mary is a 34-year-old stay-at-home mother with 2 children. She had a cavity 16 years ago when she was a teenager, and the experience dramatically changed her perspective on her oral care habits. Mary says that she brushes her teeth twice daily and flosses about once a week. She does admit to missing a brushing here and there due to her home life with young children. Most important, she does not have any risk factors. She is currently not taking any medications and does not snack or drink anything other than water between meals. Mary has been focused for the last few years on “getting back in shape” after her pregnancies and has kept a good “3 small meals a day” schedule. She does not have any plaque buildup or any other medical conditions. Her CariScreen test had a result of 226, showing that she did not have a biofilm challenge. 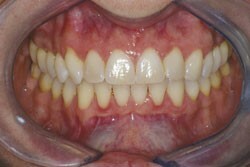 She has not needed any dental work since her filling 16 years ago and, as a result, has no disease indicators. She is low risk for dental caries. Mary’s dental practitioner shared Mary’s caries risk assessment results with her and encouraged her to continue with her current diet and home care program and to let her know if anything changes. To date, Mary has had no new cavities.